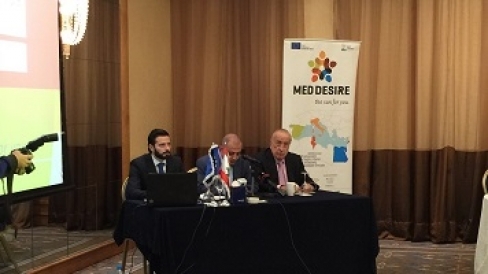 Within the MED-DESIRE project, the Lebanese Center for Energy Conservation (LCEC) hosted a press and media event on December 2, 2015 at 10:30 am at Gefinor Rotana Hotel in Beirut, Lebanon. The event “Energy experts meet the media: important renewable energy and energy efficiency topics” was an interactive workshop between energy experts from LCEC and the press and media. The event was held under the patronage of the Head of Editors Syndicate, Mr. Elias Aoun and with the presence of Mr. Pierre El Khoury, LCEC General Director, and LCEC Staff. The media was introduced about the latest achievements in the clean energy market in Lebanon in order to transfer it to the general public. The event witness the attendance of 50 participants from journalists and editors of magazines and newspapers such as Al Safir, World Environment and Al Nahhar, to reporters from TV channels like Orbit, Al Manar and NBN and from radio stations such as the Lebanese Radio. The opening speech was done by the vice president of LCEC, Mr. Ziad el Zein, where he pointed out that the workshop is being held in parallel with the COP21 Climate Summit in Paris, which also started on December 2, 2015. Mr. El Zein emphasized on the importance the integration of the media and even economists in climate change topics. He then added that LCEC always strives to develop and update plans and strategies that will assist the Lebanese government in reaching its renewable energy and energy efficiency targets and stressed on the importance of initiatives and pilot and demonstration project to support national plans. Following this, the Head of Editors Syndicate, Mr. Elias Aoun, thanked LCEC for organizing the workshop and for giving the chance for the media to benefit from the experts’ information about the state of renewable energy in Lebanon. He added that power or Lebanon’s power is being wasted in the sea; as such, efforts from LCEC are needed to tackle this issue. He also addressed the media by saying that they should ask about the importance of energy conservation and how to use it efficiently. Then, a presentation was done by Mr. Rani Al Achkar, LCEC Programmes Development Engineer, where he presented the goals and objectives of the MED DESIRE project. He stated that the project will be complete by the end of the year 2015, however the LCEC will keep supporting the Ministry of Energy and Water to achieve all its goals. Mr. Pierre El Khoury, LCEC General Director, intervened to confirm that Lebanon is moving the right path in achieving the national target of 12% of renewable energy supply by 2020 and reducing energy demand by 5%. Round table discussions were held between the energy experts from the LCEC team and the media. Discussion topics were about the National Energy Efficiency Action Plan 2016-2020 (NEEAP) moderated by Dr. Sorina Mortada, the National Renewable Energy Action Plan 2016-2020 (NREAP) by Dr. Joseph Al Assad, the National Energy Efficiency and Renewable Energy Action financing mechanism (NEEREA) Mr. Mohammad Allouche, the Lebanese Environmental Action financing mechanism (LEA) by Mrs. Reine Maalouf, and the solar water heaters market support schemes by Mr. Haykal Khalil. The workshop ended with the development of a set of recommendations to write articles and media reports increase awareness on energy topics. The event was followed by lunch.